From the outside Crocker’s Folly is just an unobtrusive little pub near Lords Cricket ground. It was constructed by a Mr. Crocker whose apparent folly was to believe that Marylebone Station would be built next door, he was unfortunately mistaken and missed out on all that bustling train station trade, still he must have gotten the crowds from the cricket I suppose. However, whilst the building was a bit of a folly in that sense it also, on the inside represents a pretty perfect example of the other meaning of the word. 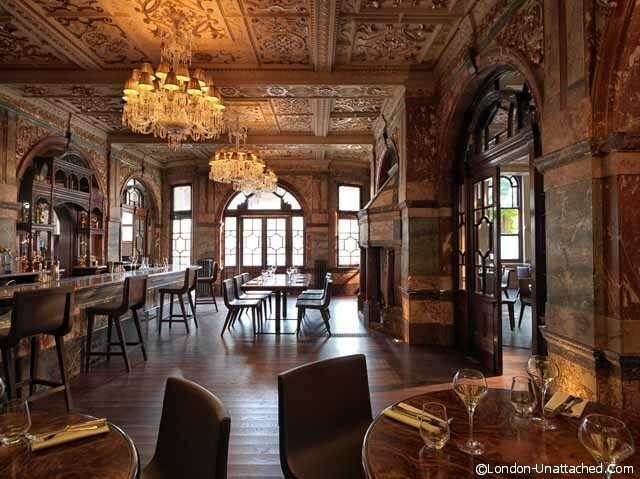 Like the faux gothic abbeys and picturesque pre-fab ruins popular with the Victorians Crocker’s Folly’s interior is a bizarre and magnificent fiction that brings the interior decorating of the most extravagant Italian palazzo to the inside of a pub in London. Crocker brought in a vast array of marbles and plasters to fit the place out like a cross between the Vatican and Las Vegas, the fireplaces are huge, and stunning, and the new owners have added their own Murano chandeliers, each about as big as a small car. So walking into Crockers is definitely something of a gasp-inducing experience. I clattered in on a cold and wintery evening, as always a little flustered. I proceeded through the various lofty marble rooms to our table and was immediately met with the rather pleasant sight of the Crockertini, an intensely melon-y martini that was just sweet enough with out being overpowering, with a pleasantly fresh flavour and a little bite. This was probably my favourite cocktail of the evening though I would also give a shout-out to the Espresso Dessert Cocktail, which actually managed to taste like it was made using nice coffee, I think a first amongst the coffee cocktails I’ve tried. 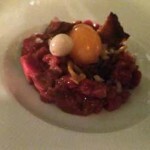 As a starter I kicked off with Beef Tartare, although I almost regretted it after the orders had been taken, as soon as I had a second look at the menu, and noticed I could have had beef cooked in their Josper as my main. Having said that when the Tartare came the idea of feeling annoyed with myself over my choice faded pretty quickly as it was delicious. A wonderfully tender texture with a sharp and sweet dressing and a perfectly cooked egg yolk in the centre, even though this was a chilled dish and I had just come in from the cold, it felt gorgeously invigorating. For my main I went with lamb with a soy-infused gravy. The meat was cooked just as I prefer it, delicately pink on the inside and deliciously juicy. 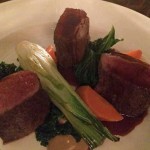 The sauce was rich, the soy adding a deep, savoury quality that the soft lamb soaked up immediately. Also, and this might not be an issue for everyone, but I liked the fact that the serving, whilst generous, was not absurd, meaning that I could finish my plate happily, feeling full but not uncomfortable, even looking forward to the prospect of dessert. 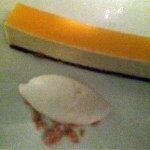 This took the form of an orange cheesecake which arrived looking hugely inviting. A thin layer of intensely flavoured orange gelatine was layered at the top, giving the dish a bit of pep whilst the body of the cheesecake wobbled perfectly in just the right bracket between being creamy and being set like a jelly. Overall Crocker’s Folly is worth it for the visuals alone, if you ever want to pretend to be a crazy billionaire with extravagant tastes this is not a bad place to come and role-play. However, alongside the stunning interiors there is also a gorgeous restaurant here with a straightforward but very satisfying menu. It is detailed in an amazing way. If those chandeliers are as big as cars, they must really blast the glam. I am always a fan of ornate ceilings..this one looks interesting.